I have no problem sharing with the museum, anything that can enhance or contribute to the goals is the aim here! The problem is I am a little obsessive about being thorough and as complete as possible with all the information. That being said it is incredibly close to being done. For the property ownership they really provide the starting point, the work flow I use when digitizing these is to use the owner on record as the last known owner and then go to the registry of deeds to see if the property is still under their ownership and if the parcel has been split off at all. The registries are incredibly accurate due to being THE repository of legal ownership and transfer documents and they are updated daily. So this definitely got shelved for a while! I will upload it as soon as I can and create another Google Map for it. The mapping is complete from Wiscasset to Pittsfield and from Weeks Mills to Farmington. I had to make a few tweaks here and there to correct for obvious errors in the surveys, most of which were probably made when the plans were being copied into the record books. There are a few places where the map was clearly drawn freehand (Waterville from the Kennebec River to Western Avenue, and through the village in Oakland) the scale, station marks (cumulative distance notations), and landmarks are incredibly far off. As for current property ownership, that wouldn't be too difficult at all, especially for the original ROW (Wiscasset - Albion, Winslow). All of the towns involved have their tax maps digitized. The difficulty would lie in connecting the lot to the current owner but the map, without further analysis and processing, would at the very least show the local Map/Block/Lot numbers for the parcels the ROW passes through. Description of the land taken which includes the distance along the center line, acres, and ROW width. Original Railway / The Pittsfield Extension!!! -Written Description of the W&Q Survey from Wiscasset to Burnham. -Written Description of the W&Q Survey from Wiscasset to Burnham as Ammended. (I think this is the 'As-Built' description). -Written Description of the W&Q Survey from Burnham to Pittsfield!!! I didn't get a complete group of images for the first one, I think I got all of the second one, but I have images of the entire Pittsfield extension. This is the official location and not a preliminary survey. There are some problems though that I haven't encountered in any significance in the other descriptions I have located. I may be able to find another description on Monday to resolve this though, so we will see where this goes. -Still following road the grade would be running where there is now water, I think about two or three times the width of the road to the east. -Now in the area to the east of the second curve in the reverse curve of Route 11/100 I get into a problem with the description, the described route, based on the headings given for the tangents, has the bed veering east, but the curves given have the bed going slightly west of north. There is a clear line to the south of this that runs SW to NE but I am confident that this isn't associated with the railroad but a gas/oil pipeline. So follow the clearing for the pole line again to Route 11/100 and cross the road about halfway between the Webb Road and the Sebasticook River. -Go about to the MEC and veer east and parallel the tracks until you get to Raymond & Railroad Streets. This would be a logical end for a planned connection with the Sebasticook and Moosehead Lake RR to Hartland/Harmony as the wye is directly across the MEC from here. And to support all of this there is mention that the sub-grade had been started and it is visible when studying a map with 2 foot contour intervals. Add a grist mill (found on an 1879 map), and anything associated with agriculture. Albion was, and still is, a largely agricultural community, hay, milk, grains, etc. Being near Clinton it's possible that the dairy industry was significant, Clinton is the largest dairy town in the state (13%), and last I knew cattle out numbered people 2:1! No liens on this in Kennebec County between the railroad and Sherwin-Williams or even Frank Winter and his associates / associations, not any real liens to speak of involving the railroad. I believe I have seen it referred to as a court judgement concerning a Portland paint company, so when I can get to it I will pop into the courts in Cumberland county and Lincoln and Kennebec as well to see what can be pulled up. I got lucky this weekend! No, not that kind of lucky, the kind where you find something you thought didn't exist. I think a more accurate term would be to say that I may have struct W&Q RR gold. I discovered, then bought, an original, hand drawn, in color, plan for the W&Q crossing of the MEC at Burnham. 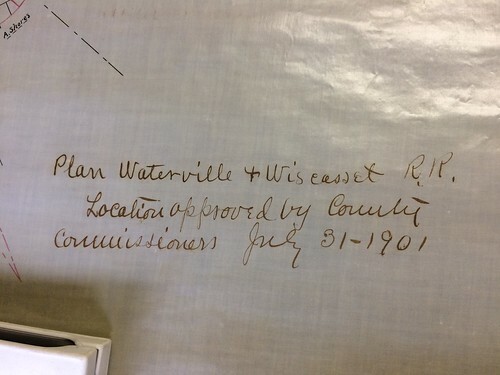 Now this is similar to the plan I had shared that I retrieved from the Maine State Archives, but that was a blueprint copy that was sent to the Railroad Commissioners. What I managed to find is, I believe, the original drawing done by the Chief Engineers Office at the MEC. This might be the only other copy of this document in existence (I am hoping anyway!). Also...are 6 pages (one page of notes didn't scan well so I will add it later) of correspondence between the MEC and the W&Q!!! I think this is a little unique! 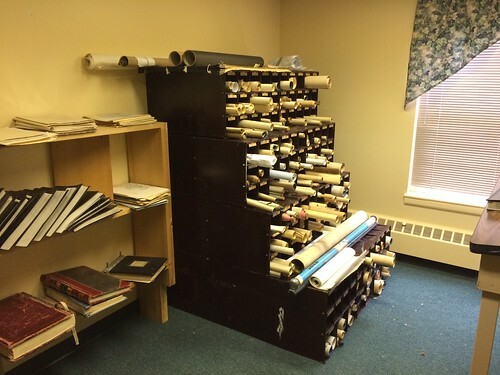 And on the side, there are SEVERAL blueprints, linen, and other plans of other railroad related items. Most of it is related to the Belfast and Moosehead Lake such as ROW maps (Burnham Jct. shows the location of the abandoned W&Q), Belfast track plan / yard layout, City point bridge drawings, as well as 2 out of what would probably be 3 plans for the Somerset Railways Kineo Extension (on linen) drawn to 1"=400', a plan and elevation profile of the North Anson & North New Portland RR (never constructed) also on linen, a plan of the European and North American RR, and quite a few more!! To say this was an exciting find is an understatement!!!! I haven't decided what to do exactly with everything at this point, I would appreciate any ideas of value though (PM me), such a unique item is tough to peg. I will also consider reaching out to historical organizations to, at the very least, get a high quality copy to those that would like one, and I will be getting in touch with the archives to possibly consult with them on some of the material. Original Railway / Re: FS&K Ry - A little teaser! Philip, that is pretty great. I had one of the State of Maine that was probably about the sames size, 1901, and had the line from Farmington to New Sharon. Girlfriends (later to become wife) dogs ate it.